WEST LAFAYETTE – Purdue, for the third straight week, either led or were tied at the first half, only to fall on a lopsided loss after a poor second half. 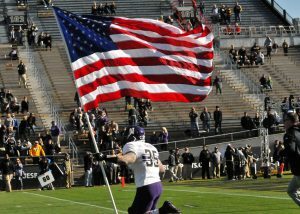 Clayton Thorson passed for a career-best 352 yards and three touchdowns, and Northwestern scored 31 second-half points Saturday on its way to a 45-17 victory against Purdue. Thorson, who also ran for a touchdown, completed 23 of 36 passes, including five for 92 yards and two touchdowns to wide receiver Austin Carr, who tied the school single-season record with 12 TD receptions. Austin Jackson rushed 22 times for 127 yards and a touchdown, and John Moten IV had 16 carries for 119 yards, marking the first time since Sept. 14, 2013 against Western Michigan that two Northwestern backs rushed for more than 100 yards in the same game. Thorson’s third touchdown pass — a 42-yarder to Garrett Dickerson on the first play after an interception by linebacker Anthony Walker Jr. — gave Northwestern a 28-10 lead with 11:13 remaining in the third quarter. The Wildcats (5-5, 4-3 Big Ten) steadily pulled away. 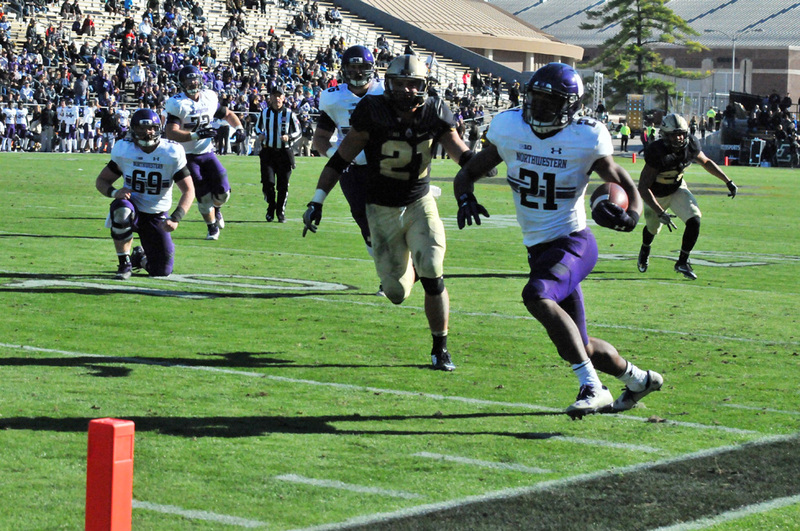 Finishing with 605 yards of offense, Northwestern outscored Purdue 31-7 during the final 30 minutes. Northwestern spotted Purdue (3-7, 1-6) a 10-0, first-quarter lead, then scored the opening half’s final 14 points to lead 14-10 through 30 minutes. Purdue lost its fifth in a row. The Wildcats extended their lead to 21-10 on Justin Jackson’s 14-yard touchdown run, capping a seven-play, 71-yard drive. David Blough threw for 184 yards for Purdue, but turned the ball over three times on interceptions, the Boilers losing the ball four times overall in the game. Bilal Marshall had a 49-yard touchdown catch and Blough had a one-yard touchdown run in the loss. The Wildcats travel to Minnesota on Nov. 19 for their final Big Ten road game. The Boilermakers will play host to No. 7 Wisconsin on Nov. 19 in their final Big Ten home game. Purdue’s Bilal Marshall reaches over the goal line for a touchdown. 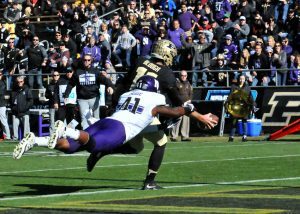 Purdue quarterback David Blough stretches the ball over the goalline as Northwestern’s Jared McGee attempts the tackle. 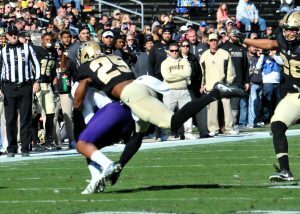 Purdue’s Antonio Blackmon makes a stop. Crown Point native Tom Hruby leads Northwestern into Ross-Ade Stadium.